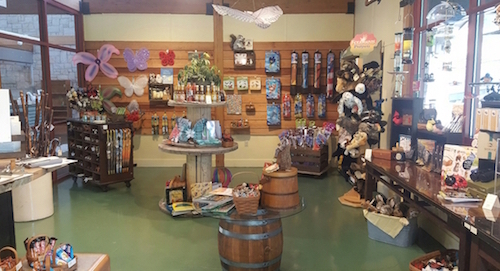 I write about a lot of events for Oglebay Institute: wine tastings, nature walks, art exhibits, and the occasional exciting retail experience. And as much as I do enjoy the evenings that include grapes, I was thrilled to receive an invitation to the soft opening of the Samara Shop, the new retail space at Oglebay Institute’s Schrader Environmental Education Center. I really love to shop, and nature-themed gifts often top my list. 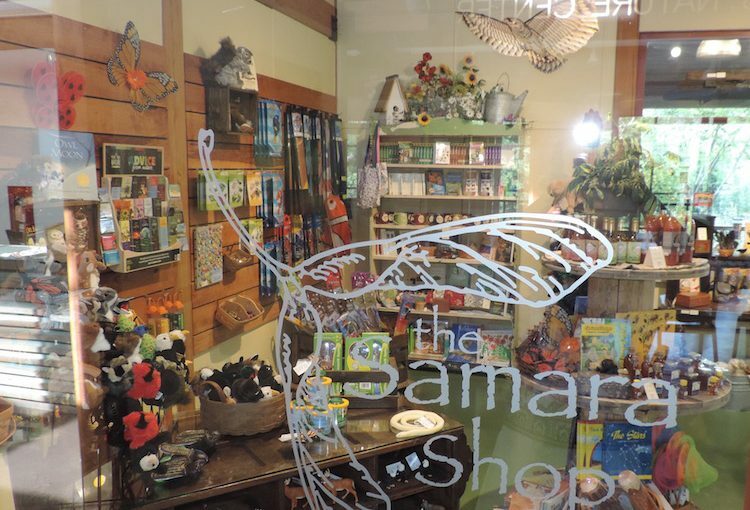 So, what is a samara, and why is the word attached to a gift shop? Samaras are, in their most basic terms, winged achene. (Say what?) The dried fruit of a flowering plant. (Hmm…) You know those little helicopter things that fall out of the trees every year? (Oh, okay!) This is a samara. Their wings provide them a chance for a more extensive dispersal. They come in pairs, and every year in my backyard the ancient silver maples send them down by the thousands. Kids love ‘em. I think adults do too, and they always make me smile. They serve as a joyous reminder of spending time outside playing in nature and represent nature’s unwavering ability to create new life. When you walk into the Samara Shop you’ll see one etched into the floor. So now you know the why. But what is the Schrader Center selling in the Samara Shop? This answer is nature-themed gifts carefully selected to captivate a sense of wonder and adventure. But, while I think nature books, crafts, and interactive toys for kids are important, I often hesitate to spend my money on them unless they’re going back into the regional economy. So as I walk in, I’m a little wary. The Schrader Center employees are waiting for me. They’re very excited about this soft opening, as they should be because the shop is light and colorful. I introduce myself and immediately catch sight of a familiar stoneware mug. It’s heavy and bears the imprint of a samara, and before the ladies by the counter can even open their mouths, I recognize it as the work of Mud Ceramics of Thomas, West Virginia. In fact, I’ve just broken my own beloved Mud mug last week and have been drinking my morning coffee out of some abominable cup with a smart-aleck fiddler crab on it and a chip on the rim. So far, so good. The employees give me a tour, and I’m drawn to an owl painting by Sue Smith. I’ve mentioned her in previous blogs: She had a booth at the Artists’ Market at Oglebayfest and at the Holiday Art Show and Sale. She paints birds. 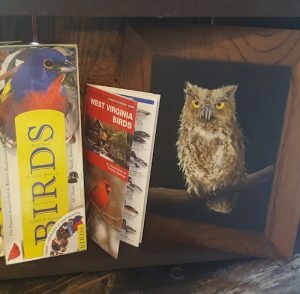 My husband and I have a special fondness for owls, and the Samara Shop ladies have placed this particularly cute screech owl painting right where it catches my eye. As much as I hate to tinker with their artful display, I take the owl painting for a Father’s Day gift for my husband. Alice Eastman, Director of the Schrader Environmental Education Center, stops by and notices the owl painting sitting by the register. She recognizes me from her rain barrel class. We talk about the shop, and she tells me that the most popular artists from the Holiday Art Show and Sale are now featured here in Samara, including Sue Smith. I also recognize a collection of Appalachian Mountain Specialty Foods’ items, including the ramp dressing I fell in love with last year. Nearby sits Family Roots Farm’s maple syrup, and soon the shop will carry Windswept Farm’s Wildflower Honey, which I regularly buy at the farmer’s market. After perusing the edibles, I inspect the literature section. I see children’s books like Stellaluna, about a wayward fruit bat, Outwitting Squirrels by Bill Alder (for those who must wage war on the furry-tailed purloiners of birdseed), and field guides to reptiles, mushrooms, and birds. Many of the authors are local or regional, and I pick up a copy of West Virginia author and Canaan Valley educator George Constantz’s essay collection, Hollows, Peepers & Highlanders, noting other books that will make good nature-themed gifts at Christmas. I also see a selection of beautiful kites my kids would like. Alice reminds me that the shop will have seasonal items as well, the selection changing with the holidays. As I’m buying my book and my owl painting, I note that the Samara Shop also sells rain barrel kits. Thus far, summer has proven to be hot and dry, and the barrels we made during a Saturday Schrader class filled up in one rain event. I’ve been using that water for my gardens and koi pond. They’re available for $55 and can be easily installed. If you’re interested, the shop employees are happy to help. When I was a kid, my dad took me to the A.B. Brooks Nature Center every few weeks to buy birdseed. I remember the dark wood, the variety of bird watching books, and the snakes in the basement. The Samara Shop feels different: bright and open but just as comfortable. And, more importantly, the employees at Schrader and Samara maintain their devotion to environmental education. Back then, if we had a bird or a frog question, we knew someone there could answer it. This remains the case today. 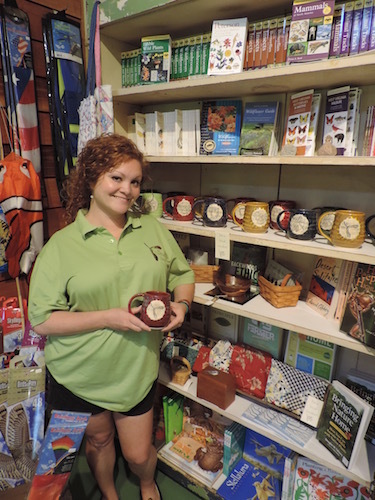 In addition, Samara offers locals and visitors alike the chance to find creative, local, nature-themed gifts. 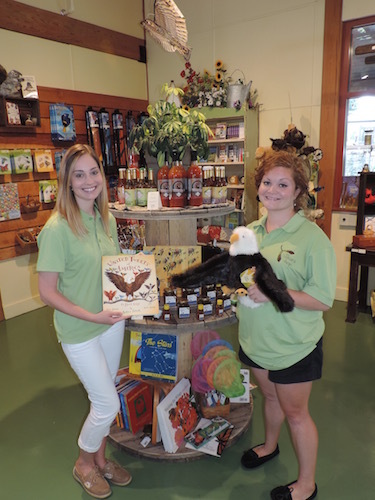 You can get your nature on and stop by to find birthday presents. You can learn how to collect rainwater, grab an Appalachian Bloody Mary Mix, and find a pair of chickadee earrings. That is, of course, if I don’t beat you to it. Update: The Samara Shop opened for business on July 2, 2016. Winter hours (January-March 2017 ) are 12-5 Wednesday- Sunday. Spring, summer and fall hours (April -December 2017) are 10-5 Wednesday-Saturday and 12-5 Sunday. The Schrader Environmental Education Center is open daily and can be reached at (304) 242-6855.